Saban can park however the frick he wants to anywhere in the State. Not taking two spots. No problem with this. In parking, just like recruiting, Saban always takes it outside the lines. It’s funny you think Saban parks his own car. Maybe CNS can’t afford car insurance...just playin it safe. Buck Fama! Fold Tide fold. Buzz Williams will have Jimbo park his car at mid-court when he signs with the Aggies. He doesn't have a UA tag. 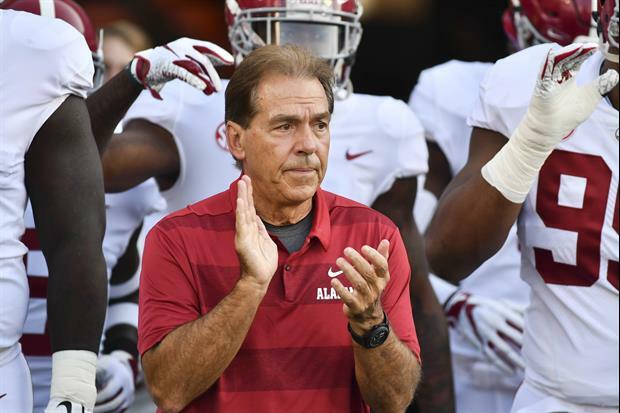 Saban could build a barrier around his car with freshly killed puppies and nobody in Alabama would tell him shite. Someone should jump up in that spot and paint some blue handicap lines around that spot and call to get it towed. Great now I know how savants car looks and parks I can take my 2010 Malibu and side swipe the prick! Why do people back into parking spaces. Its irritating. For safety reasons , ya fricking prick. It's an alpha male thing. Maybe one day you will understand. I would love to see his reaction if someone parked right next to him at the same angle. His handlers would probably taze you. If I had a coach as successful as him I'd have him a parking spot inside the conference room. I'm much more shocked he doesn't have his own spot or a chariot pulled by the bench riding 5* linemen. Not shocked by the idea that he pulls a Dbag parking move, given the opportunity. Guess Chargers are only good for the players. I don't blame him for parking like that when you have an expensive car. If other people would learn how to drive and quit backing into cars, then maybe he could park like a commoner. And that looks like a woman's car. Saban parks his car like an a-hole because thats what he is. He parks it like that cause he can. He's one of the few who can truly not GAF about what most anyone thinks.